Sali ako. But it's only a Standard but at least sunburst. And most important of all, simple pattern lang yung bedsheet. Baka mag comment kayo. eto misteryo. katawan strat, the rest tele. and they call it a '51 squier. but i like it. and it's what's accessible and affordable. ano tingin nyo maganda ipalit na PUPs? hey ito ba yung pinasetup kay jun a few weeks ago? si reg to! wats your name again? i think i also recognize the other guitar. greco yan diba? Your welcome bro. Its great you are pleased with the makeover. Hindi lang external yan, pati pickups make over din. 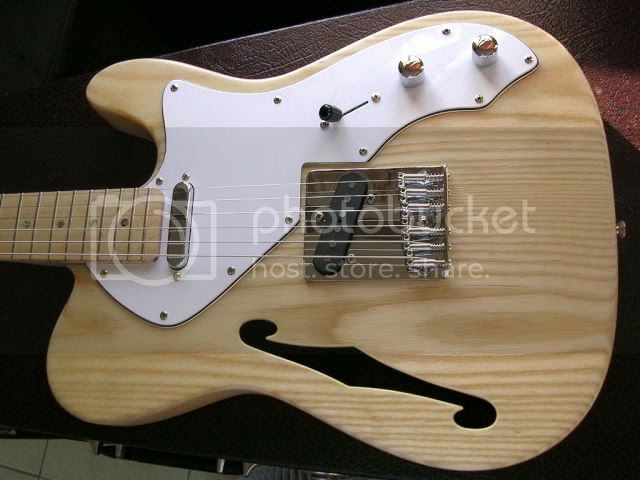 Eto naman tele ko, a fernandes revival tele. 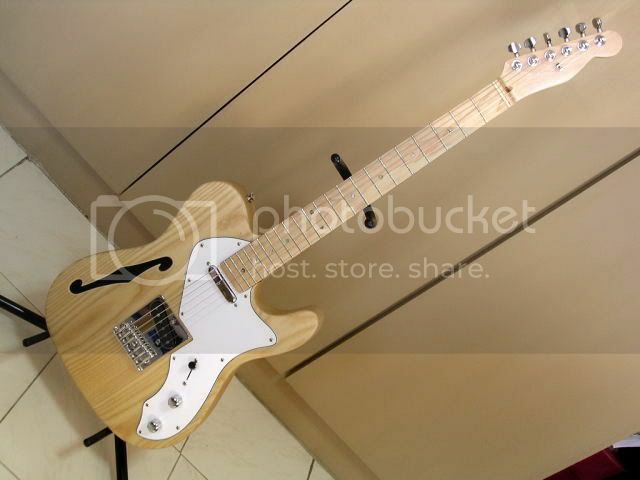 After 4 teles, I think I have found the one for me. wow! ganda pati kulay. Fernandes pala tele mo. 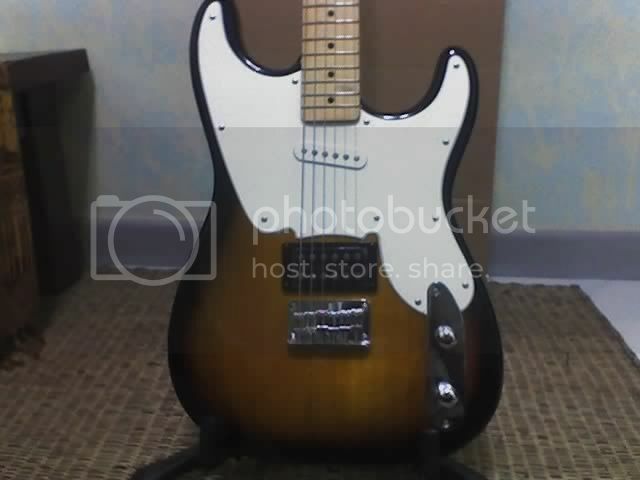 ganyan maganda rin na kulay for a strat don't you think? and thanks nathan. 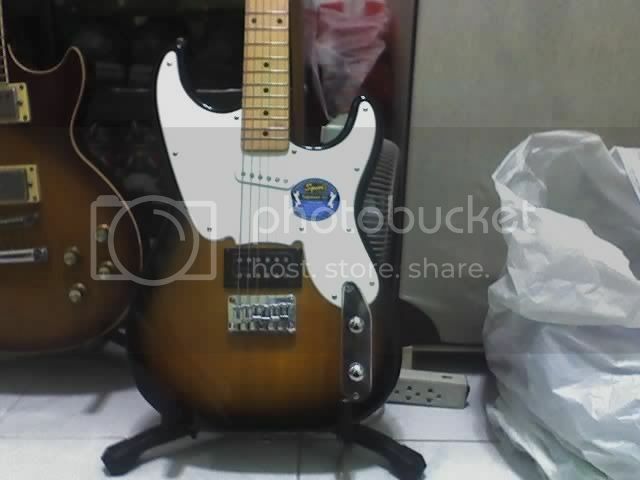 i guess i have to lean some chops that are "tele"esque para bumagay naman sakin yang bagong ayos na tele. grabe tong tele na to.. one of the best ive tried and played.. ACK! you add fire to my tele GAS sir mike! na snob ko nga yung vintage strat mo dahil dito haha! mas dark pa ng konti sa actual yan. na over sa flash eh. Im excited to start out strat makeover. Erwin, hindi pa naka compensated brass saddles ito nung matest mo. Ang laki ng effect sa tone. nag warm-up and mas nagkabody pa.
gaganda ng mga tele nyo!!! i really have to drop by soon! dami mo tricks (axes) up your sleeve a! Strats are indeed cool and that is the only guitar I could never be without. If I could just keep one of my guitars, it would be one of my strats. However - there is a certain sound that a tele can make that you cannot get out of any other guitar. It's hard to describe it, but it is a certain "crunch" that comes through on a good tube amp - think Keif Richards. You just can't pull it out of a strat or any other guitar. So I always keep a couple of teles just for that. Tele necks are also awesome. "Doc Rick" Even when life is a bed or roses, there are still those damn thorns!! Holy shet pare, that's nice! Where'd you get it and for how much? How does it compare to other guitars or a real Tele if you've ever had the chance to play one? it's a 52 reissue silver series MIJ squier. i've had it for 10 years now. mods include an SD hot rails in the bridge. took away the neck pup from the wiring. as well as the tone pot po. used a spin-a-split wiring i got from the net, which lets you dial away the humbuckin in increments so you could get a useable single coil sound. and dropped B tuning. love its sound for metal music. it's very crunchy and angat na angat sa mix. Got dis tele from my friend Tolits. It used to have black pkgard. After a little makeover, yan na sya ngayon. I wont disclose the price kasi marami yata akong naunahan bumili nito eh. Definitely one of my best aquisition this year. TY. I'm not sure if I posted this question in the Yupangco forums. I have an old Japanese Silver Series Sunburst Telecaster. 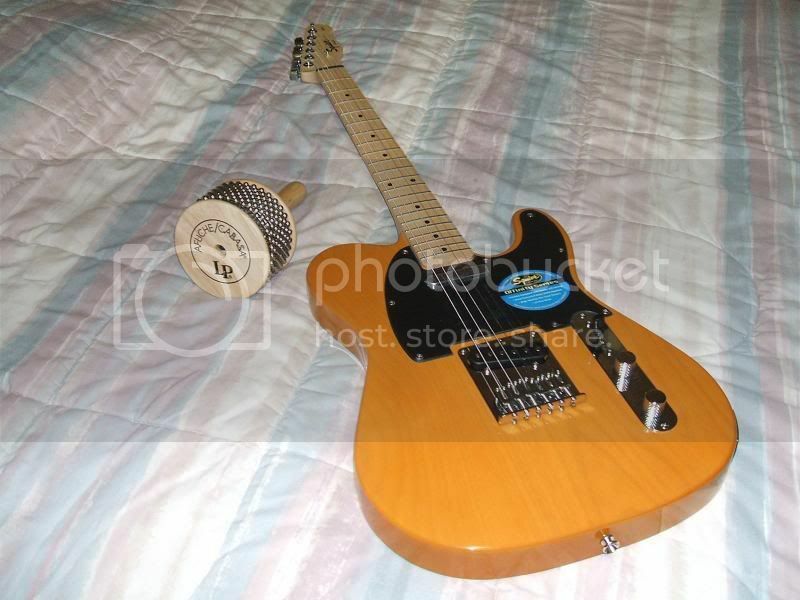 Since I was a kid, I've always wanted to have a natural finish Tele. However, this was a gift to me by my father when I was 14. It was bought in 1993, at Yamaha Robinson's Galleria. All I know is that it's a Japanese Tele, and it's a Silver Series Tele. If you have any more information, please let me know. Thanks. It's pretty neglected. It was my main axe for more than 10 years. And since I wasn't really aware of it's value, it was neglected. The neck is twisted and bent, the electronics are messed up, and there are a lot of scrathes and chips on its finish. Would it be blasphemous if I sanded all the paint and have our local luthiers re-finish it with a natural finish? also, I'll be buying new electronics too...so if any of you have parts...pm me...I'm looking for a new bridge pickup(I'm considering a Seymour Duncan hotrails) and new electronics. Also, since the saddle screws have lost their thread, I'm also looking for new ones, or a completely new bridge assembly...the problem with a new one would be that I would have to drill string holes and buy new ferrules(actually that's note really a problem). What do you senseis think? 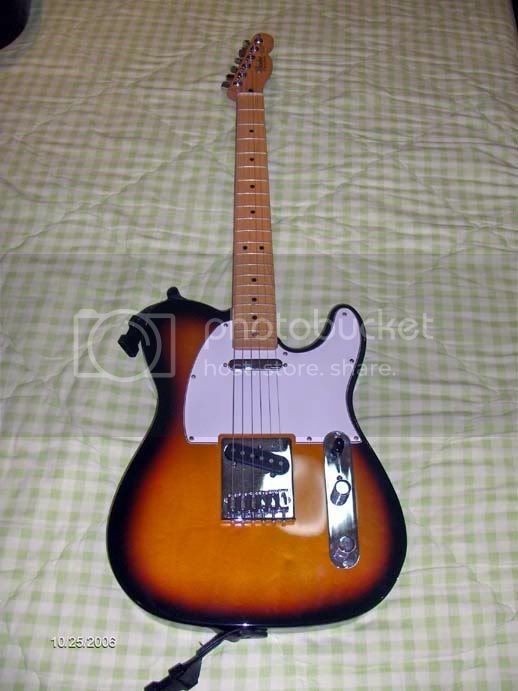 if its natural you want, then go ahead pero i like the beat up tele look. a lot of people pay big bucks for the relic look. have the neck fixed muna (looks like it needs refretting too) pero advice the luthier not to clean it up. fix everything else. fill the screw holes then hammer in a nail slightly skinnier than the screws, then manually drill (as in push down with screw driver while turning) the screws back in. sa pickups, i guess yung hot rails would let you drop in a bucker without having to carve out a big chunk of wood, pero if you want it to still sound like a tele, stay away from the hot pickups. thank you GOD for LIFE, LOVE and MUSIC! @demet, you wanna sell that to me? that deserves a restoration! just leave the history marks alone! hey thanks for the advice. Don't get me wrong though, I like the rustic look myself. That's why I'm torn between having it sanded or just keeping it the way it is.